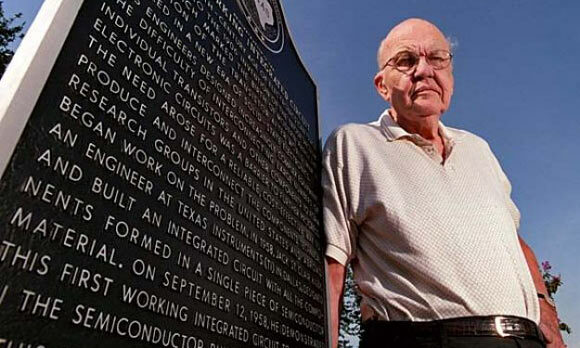 Born on 8th November, 1923, Jack St. Clair Kilby was an American electrical engineer who took part in the realization of the first integrated circuit, along with Robert Noyce. He was born in Jefferson City, Missouri, and was raised in Great Bend, Kansas, where he was brought up amongst the industrious descendants of the western settlers of the American Great Plains. John Kilby’s father ran a small electric company, and his goal was to do, whatever it took, to help people and run his business. His father worked with amateur radio operators and this is what mainly sparked Kilby’s interest in electronics. He was also a fan of broadcast radio. He studied electrical engineering at the University of Illinois. Most of his classes were in electrical power, but due to his childhood interest in electronics, he also took some vacuum tube engineering physics classes. He graduated in 1947. Later, in Milwaukee, Wisconsin, he worked at an electronics manufacture that made parts for radios, televisions and hearing aids. He pursued a master’s degree in electrical engineering from the University of Wisconsin, taking evening classes. In the year 1958, Kilby and his wife moved to Dallas, Texas, when he took up a job with Texas Instruments. It was the only company that approved to let him work on electronic component miniaturization. After receiving a director’s position at Texas Instruments, Kilby took a leave in 1970, though continuing to work with the company even after his retirement in the year 1983. He handled solar power-based research and joined the faculty at Texas A&M University. While working at TI, Jack Kilby was able to design an integrated circuit, combining previously isolated electronic elements to work together in a miniature environment that would be known as the microchip. His invention was considered revolutionary for the computing/technological world and it marked the beginning of devices that have now become a basic part of life. Jack Kilby also invented the first pocket calculator, which was nicknamed “Pocketronic” back then, along with the thermal printer. The Institute of Electrical and Electronic Engineers (IEEE) has recognized many of Kilby’s great works. The Kilby International Awards were also named in Jack Kilby’s honor and it is exclusively funded by the generous donations of the founding committee, private philanthropists, corporations, and international institutions. Their support is assisting the creation of innovative programs which benefit under-served students throughout the world.